With this module, the images will be scattered randomly in a container. When an item is selected, it will move to the middle and the others will shift to the sides with smooth effect. Moreover, the module supports for item's backface which presents such information: created date, author, comment number, short description, tags. To show the backface, you only need to click on the current navigation dot. Specially, the module allows to retrieve items from K2 component. You can select one or more categories as well as the number of displaying item. The use-friendly back-end interface allows you easily to manage any module parameters. 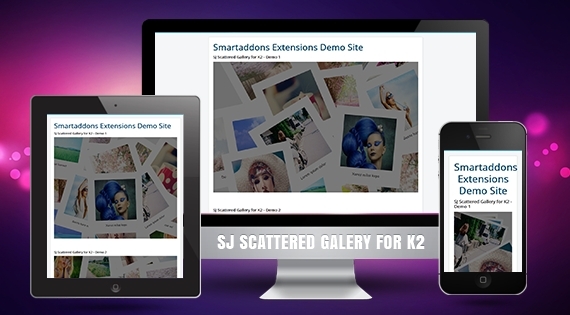 SJ Scattered Gallery for K2 can be placed on a highlight position to effectively impress your website. Let's take a preview on it now!